This post brought to you by Rock-it Oil. The content and opinions expressed below are that of Creative Ramblings. Tis the season for cooking, crafting, decorating, and celebrating. Which means despite the pretty pictures I show you here, my craft room is a disaster! As soon as I finish a project its on to the next. Christmas cards, ornaments, a wreath, and Little Lady’s birthday invitations are all on my table right now. On top of my projects, Little Lady loves to work right next to me on her crafts too. To be more productive its time to clean up and get organized! 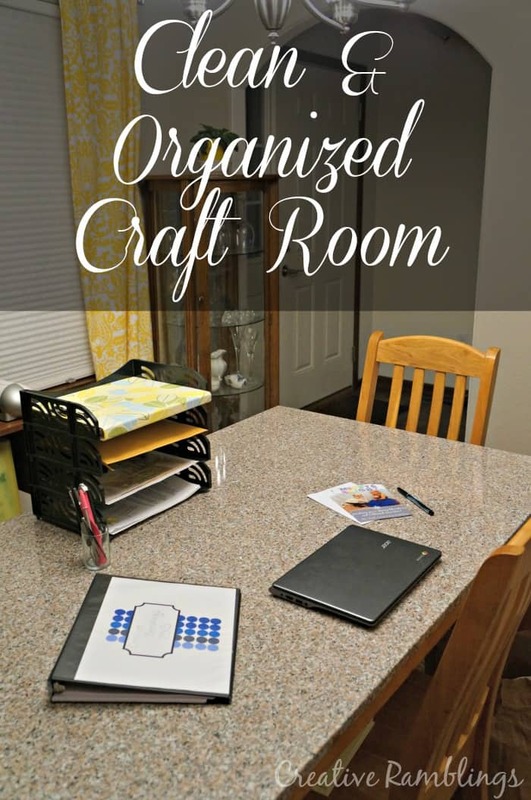 I have a large granite table in my craft room. It stands up to just about anything, kind of the perfect craft surface. I picked it up years ago for an amazing price while working at a furniture store. Generally it cleans up pretty well but it’s been a while since I’ve actually removed all my clutter and really cleaned it. It’s starting to build up a residue of glue, glitter, marker and unidentifiable gunk. 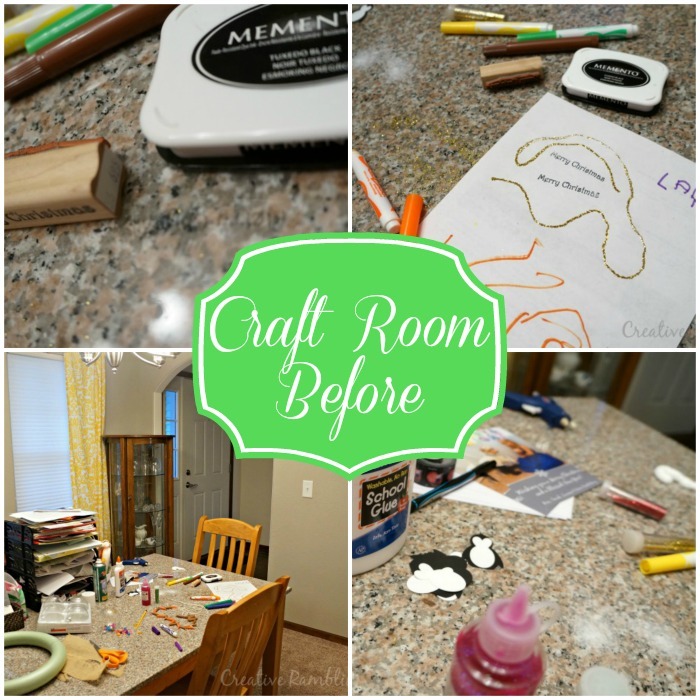 Before I can thoroughly clean the table I need to clean off the table and bring a little organization back to my craft room. Designate a place for in progress projects. I have a large flat basket with sections that hold my unfinished projects. As long as I remember to put them in the basket I can keep them together and off of my work space. Have a place for all of your supplies. If you have a place to put everything it is easier to clean up. I keep all my supplies in 2 bookcases along the wall. Weekly clean up. No matter what I am working I try *try* to clean it all up at least once a week. If I let it sit any longer there is no hope of being productive, which is where I am in the pictures above. File important paperwork immediately. My craft room doubles as my office. I have paperwork for my Etsy business that cannot get lost in the mess. I keep a set of files on my table with slots for each item I need to keep track of. This works especially well if I stick with the above point of doing a weekly clean up. Now that my table is organized it’s time to really clean it. 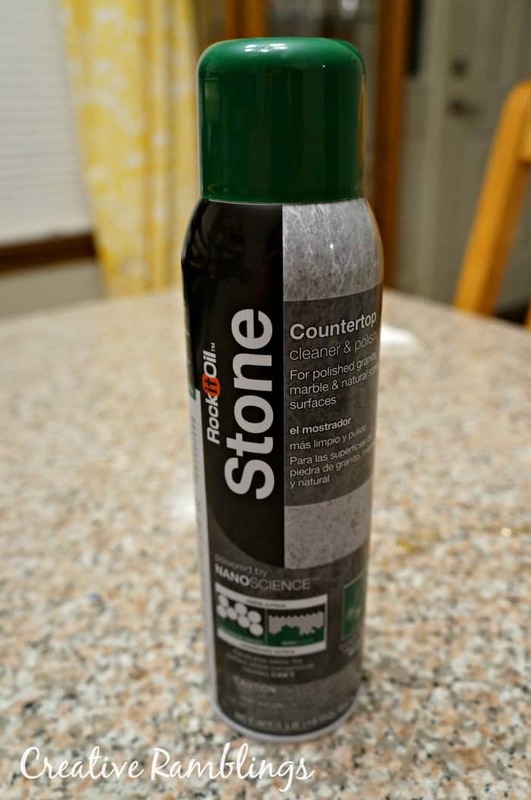 I picked up some Rock-it Oil Stone this week to give my table the deep clean it needs without damaging the surface. I sprayed my entire table and let the foam sit for 5 minutes, Then using a damp cloth I wiped it clean. I figured it would get the ink and dirt off but I wasn’t expecting it to remove the glue! After wiping up the foam I went over the table again with a clean damp cloth then polished it with a dry cloth. My table got it shine back! I haven’t seen that in a couple of years. And I am no longer working on clumps of dried glue. Once clean I put back only the essentials and one current project, then got to work on my Christmas cards. Do you have a stone surface in your home? 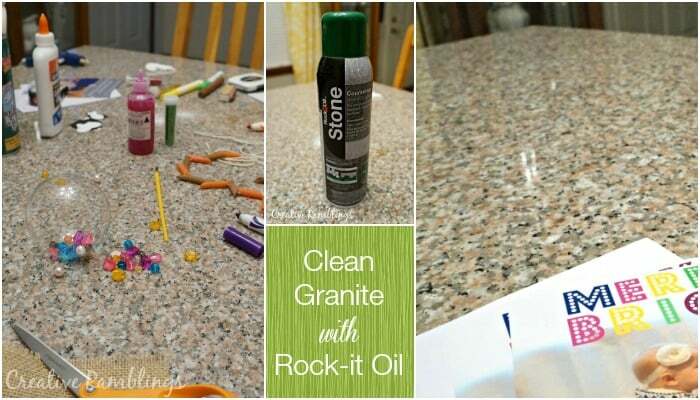 Rock-it Oil Stone can clean up your holiday kitchen mess too. Head over to The Home Depot and pick up a can in the cleaning aisle. You can also follow the Rock-it Oil Facebook Page for helpful cleaning tips. Getting your stone surfaces clean is one things, getting a whole new granite counter top is another! Enter below to win $2000 toward a new granite countertop. contest ends December 31, 2014 the winner will be announced on the Rock-It Oil website on January 5th. Great ideas! I definitely need to start keeping all of my works-in-progress together and out in the open like this!